Thank you for stopping by the I Brake For Stamps website and viewing my line of stamps they produce in high quality rubber. I've dreamed up thousands of designs over the years and I'm proud of each and every one of them. You'll notice a smaller selection of my stamps are available now, but be sure to check back each month for the latest releases and offerings. 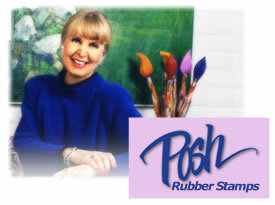 To learn more about me, check out my calendar or to view projects using my stamps, please visit my website at www.poshimpressions.com. Don't forget to come right back for more information and purchasing! Meet other stampers, participate in swaps & contests and even setup your own stamp art gallery. It's just some of what you'll enjoy as a member of Club Posh. Check it out!